You can envision Charles Gandy’s sculptural socks warming cold winter feet, or you could imagine seeing his socks in a fine art gallery. He has a show coming up at The Bascom Art Center in Highlands (see below for details) that explores this very topic. 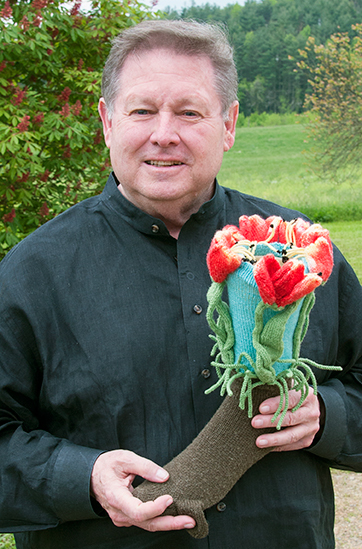 He is a TKGA Master Knitter and is a renowned designer with a published book focusing on his creative sock designs: The Embellished Sock: Knitted Art for the Foot. 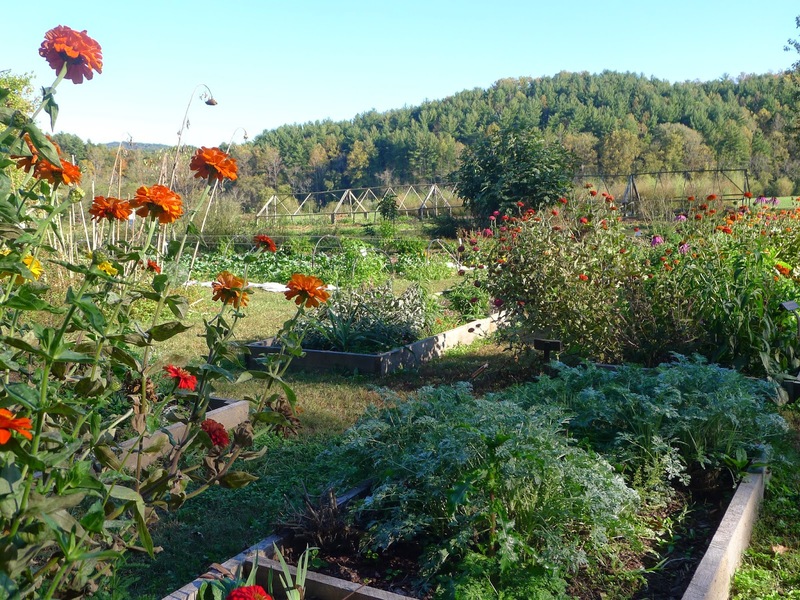 We are lucky to have Charles teach regularly at the Folk School. I sat down with him in the Wet Room Studio during his last class where students were working on fantastic knitted pieces like vegetable gardens, jonquils, and Pop Art-esque Campbell’s soup cans. Let’s find out a little bit more about Charles Gandy. CP: Your designs are just wild; I love them! Where do you find inspiration? CG: We’ve been talking a lot about that here in class. I find a lot of inspiration in nature. For example, today I looked outside and saw a tree and I thought, “Look at those leaves hanging on that tree? Wouldn’t that make a fun sock?” I look at things and I listen to things (like your banjo playing this morning). I was on a hike earlier this year and there were icicles hanging on a rock wall, so I made a note to do something with icicles. Sometimes it’s a person, sometimes it’s a yarn, or sometimes it’s a just moment where I will find inspiration. CP: In addition to nature, I noticed that places all around the world are inspirations for your work. I noticed your Hallgrim hat? CG: Oh the Hallgrim Hat! I have traveled a lot and that was a pattern based on my trip to Reykjavík, Iceland. There is an iconic church in Reykjavík called the Hallgrim church. Anybody who has been to Reykjavík has seen that church; it’s right in the middle of town, you can’t miss it. That hat has been the most popular pattern I’ve ever written. If you look at that hat, you don’t have to know that it’s from that church, but you know it’s a nice design. Do you like it? CP: Oh, yes! I love the design and then finding out the backstory about your inspiration is an added treat. CG: It’s a pretty design, and when you see the church, you see the church in the hat. When I travel, I keep a sketchbook with me to record details of what I see. I once spent three days on the floors of St. Mark’s cathedral in Venice sketching the mosaic tile patterns. I have sketchbooks that date back for 40 years where I’ve cataloged colors and ideas. 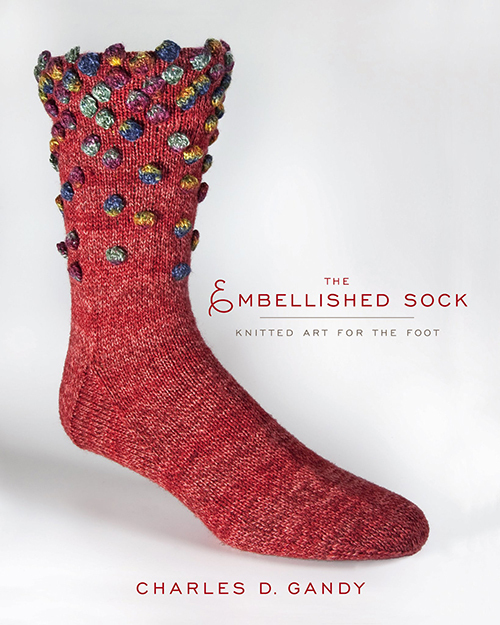 CP: Let’s talk about socks, the focus of your book, The Embellished Sock: Knitted Art for the Foot. Why socks? CG: My book came as result I entered of a contest I entered: Think Outside the Sox. 25 yarn manufacturers sponsored the competition. Each company wrote a paragraph about a project they were interested in seeing their specific yarn used for. You could enter up to five pairs of socks and some of the proposals immediately spoke to me. One of the ones that hit me was the idea of a snake in the grass. 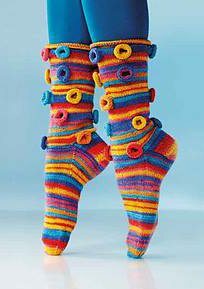 I started thinking, “How can I realize that?” Three of my designs (Dread Sox, Snake in the Grass and Pedicure Polka Socks) were winners and are featured in the book of the same name. CP: Tell me about the sock on the cover. CG: It is called Pebbles. I was sitting on the patio of a friend’s house one fall day and the leaves had blown up against the patio. You know how leaves kind of gather up and scatter back out? That inspired me to do a sock with leaves. In the development stage, I had an idea of using baubles as embellishment, and then it went from being leaves to pebbles. I do other designs besides socks. Sweaters are a prime example. I also do lots of toys, hats, mittens, ornaments, and more. I’ve become known for socks because I published the book. Socks are a fun way to push the envelope of form and function. 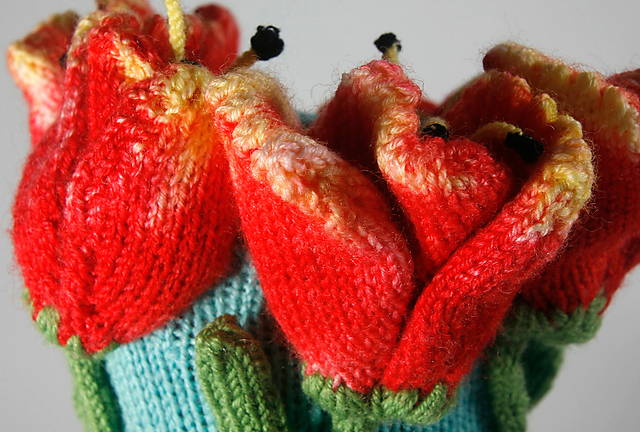 A student in class takes some inspiration from Warhol and knits a Campbell’s soup can. CP: What are you focusing on in class this week? CG: Part of what we’re doing here in this class is learning and adding tools to our design toolboxes. Students are learning all kinds of different techniques so when they get these ideas to do projects, then they can go back to their toolbox and figure out a planned to accomplish their design goals. The more little tricks you know, the more prepared you will be to create your own designs when you find inspiration. CP: So do you like to plan projects out and design on paper or is it more experimentation and happy accidents? CG: It’s a combination of all of the above. I will get an idea and let it mull around in my head for a while. I’ll think through how I am technically going to execute it and what kind of yarns should I use. I sketch by knitting samples and I try them out to see what works and what doesn’t work. A design I am working on for the upcoming show is called, “The Eyes of March,” and it’s a sock covered with three-dimensional eyes. I have been collecting tons of images of very simple eyes. I spend a lot of time practicing and making swatches and samples. The actual final knitted project is the least time of what I do. Most of it is sketching and testing. CP: Tell me about your upcoming show. 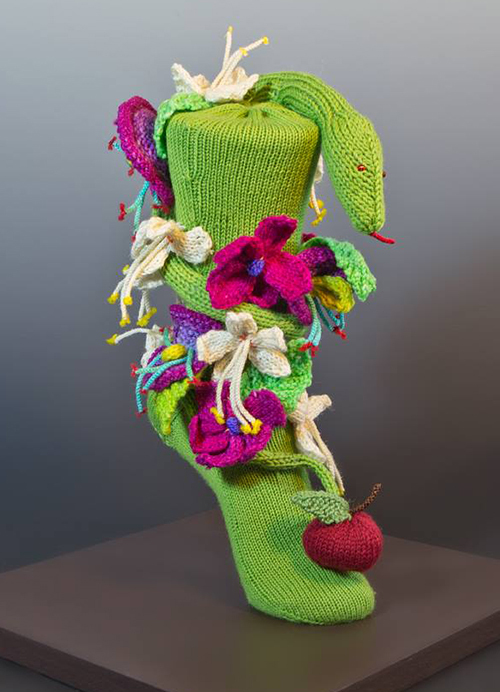 CG: The show is called Beyond the Sock: Knitted Art by Charles Gandy and will consist of around 30 pieces of knitted sculpture. 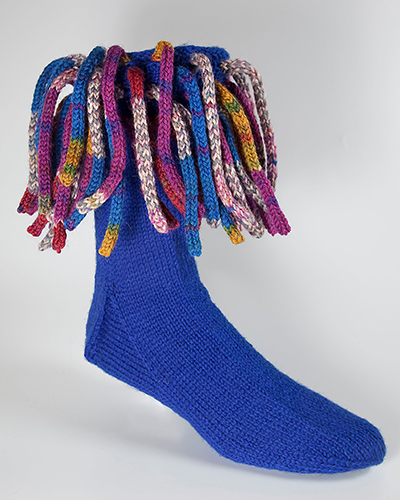 They are going to be a sock form, but they are not going to be socks intended for wearing. I’m very excited about this show at the Bascomb Art Center in Highlands, NC. I’m honored, not only for me, but also for knitters because the show recognizes our knitting as art. I want make sure this is a well-done show, so this is my primary focus right now. I feel a responsibility to represent fiber artists. CP: What’s the most meaningful piece you have ever made? CG: What a great question! Hmmmm. Maybe it’s the first thing I ever designed, which was when I was seven years old. I learned to knit from my mother when I was four or five and I have the first sweater I ever designed when I was seven. It buttons down the front, and it buttons down the back. It is a half sweater and it was designed to help use up bits and pieces of yarn. My mother had a shop and yarn shops always have one or two skeins of yarn left. This sweater was a way to help those bits and piece of yarn. I still have that sweater, so I think that’s the most meaningful piece. CG: I grew up in Alabama. I went to Auburn University. I have a degree from the school of architecture. I graduated and I practiced interior design for 40 years. I was the national president of our professional organization and I was very successful as an interior designer. While I designed interiors I was very involved with fiber. I have a minor degree in weaving. I was always knitting, weaving, and needle pointing. I also served for seven years on the Board of Trustees for the American Craft Council, so I’ve been always involved with fiber and craft. 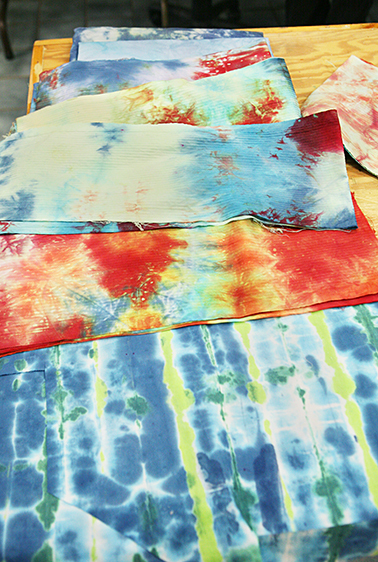 CP: How has your extensive experience in interior design informed and influenced your fiber art? CG: Design is design, so my interior design experience has helped me with my design in knitting: proportion, scale, rhythm, balance, and all of that are the same whether I’m knitting or whether I’m designing an interior. 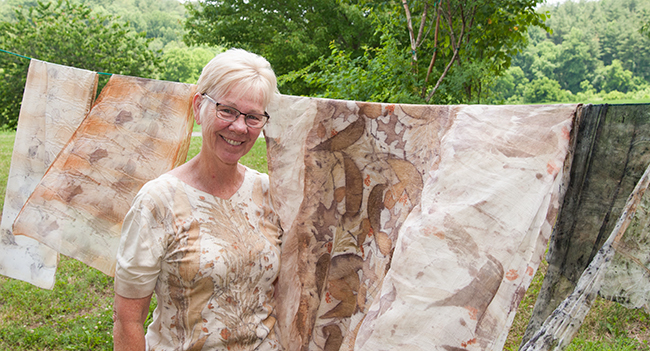 For the past 10 years, I have been concentrating exclusively on my fiber art. I left my design practice and then the sock contest came along. Shortly after that, I got involved with TKGA (The Knitting Guild Association) and I enrolled in the Master Knitting Program and I became one of 280 Master Knitters. I am only one of two men and I now serve on the Master Knitting committee. It’s very hard program to complete and I am very proud of it. I’ve been knitting for 62 years and I still learned a lot! CP: What was it like growing up as a boy who knit? CG: I learned to knit at age 4, and when I started school in the 1st grade, I was surprised that everyone didn’t knit! People always ask me, “Weren’t you bullied?” I don’t remember being bullied. To some extent, I think to be bullied, you need to allow yourself to be bullied. If they bullied me, it didn’t last long, because it didn’t bother me. My father didn’t care that I loved to knit. I’ve always loved being around fiber. Charles poses for a shot while knitting. CP: Are there a lot of men who knit? CG: Knitting actually first started as a man’s profession. 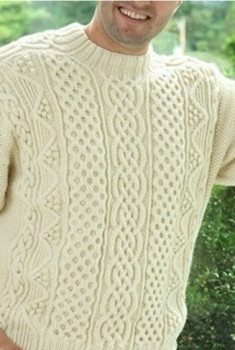 It’s almost easier to gain a reputation and notoriety as a male knitter because it’s unexpected and people will remember you. I know a lot of male knitters and the number is always increasing. I could name 15-20 very well known male designers. I was in Pittsburgh teaching this year at a conference and there were 4000 people there. I would bet that 10% of those 4000 were men. CP: How long have you been teaching at the Folk School? 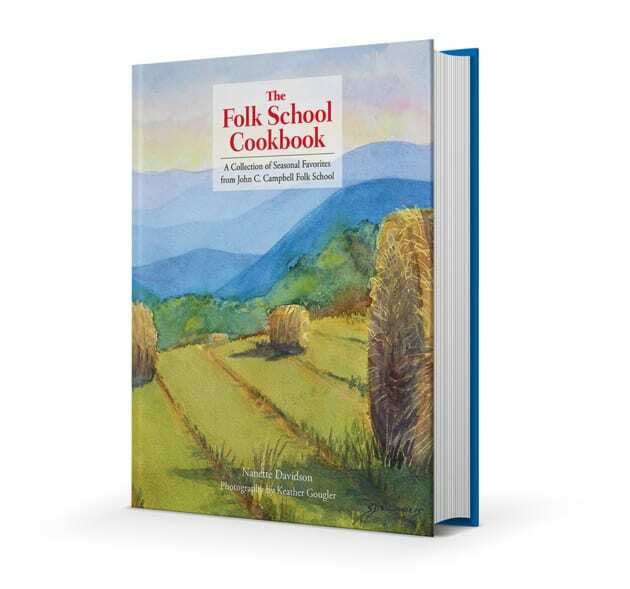 CG: I’ve been teaching at the Folk School 4-5 years and I’ve been coming 5-6 years. The first time I came, I took a knitting class and met Martha Owen. I knew right away I’d like to teach at the Folk School and this was when I was working on my book. Martha and I decided to try it and I’ve been coming back ever since. 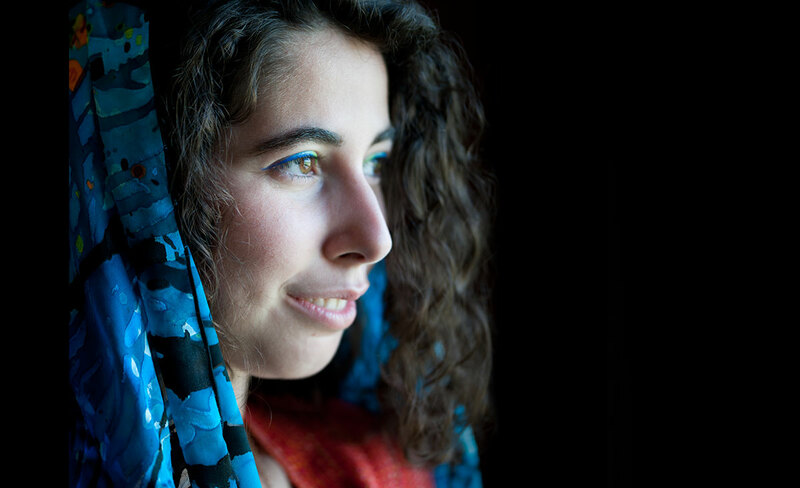 CG: I love the enthusiasm of the students and I’ve always had a really good experience at the FOlk School. People come here because they are eager and anxious to learn. I like the non-competitive philosophy and the “camp for adults” atmosphere. …but Didn’t Know Who (or What) to Ask! No fear – ask here. You can knit and purl, but what’s next? Learn different cast-ons and bind-offs, increases and decreases, fun stitch patterns, simple cables – even play with some lace and maybe a bobble or two. Finish the week learning how to seam like a pro. 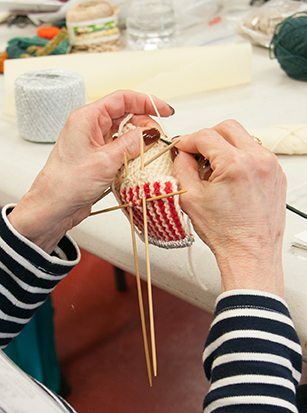 This fun experience will springboard your knitting way beyond the basics! Register today. Mosaic knitting is a form of multi-color knitting developed by famed author and historian, Barbara G. Walker. 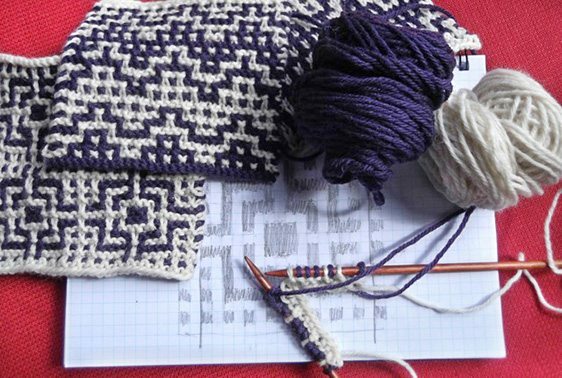 It’s a fun technique in which only one color of yarn is used in any row, but stitches from the previous row are slipped, generating complicated-looking, two-color patterns. 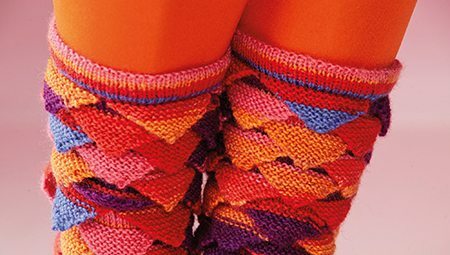 Anyone who can knit and purl can quickly learn to create these striking patterns. If you have basic knitting experience, join us! Register today. Here’s a tease: Garden of Eden! Photo by Peter McIntosh. What a great interview. Just when I think that there is nothing new under the knitting needles I see the socks by Charles Gandy. 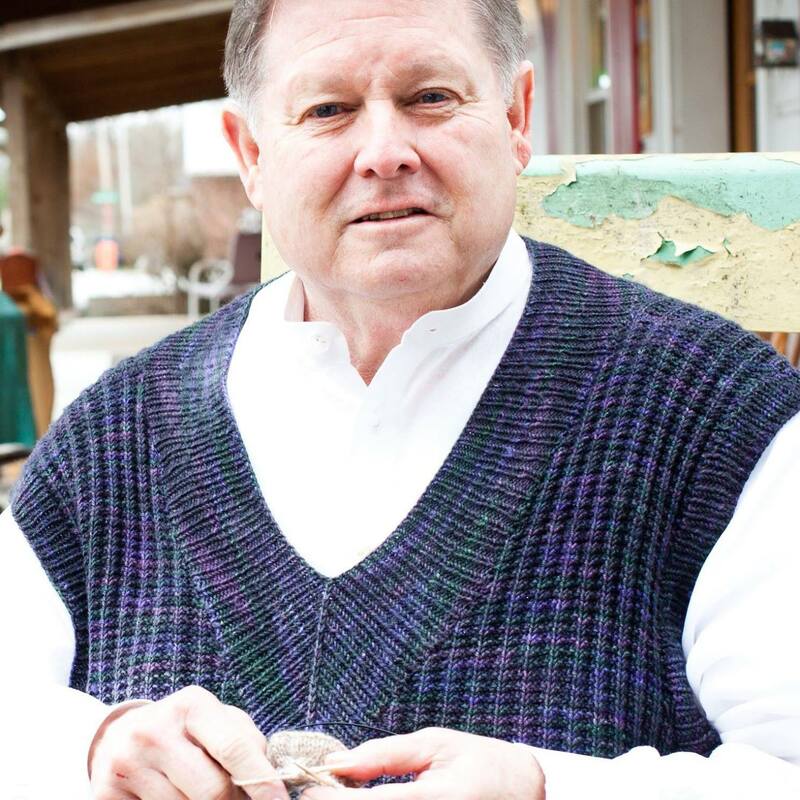 As a knitter of many years and a teacher of knitting, a subscriber of many knitting magazines, websites and owner of a large collection of knitting books, it is amazing to see Mr. Gandy’s beautiful and creative designs. There are still some people who think that only little old ladies sitting around in English villages knitting and solving murder mysteries are the only people who knit. For those of us who know better, we know that all ages have taken up their needles to create wonderful items to give as gifts or to wear with the pride and pleasure of showing off something made by one’s own hand. Thank you for including an interview in your newsletter. Great job all the way around. Tell Charles Hello for me! I loved meeting him when we took the German Lace Knitting class together a couple years back.